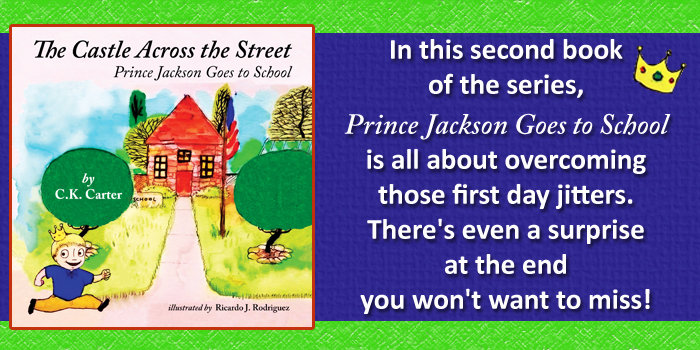 The second book in The Castle Across the Street series, Prince Jackson Goes to School, was awarded a Silver Benjamin Franklin Digital Book Award by the Independent Book Publishers Association in August 2015. You can click on the link below to check out the IBPA Winner Page for the book’s award. Prince Jackson Goes to School is C.K. Carter’s third children’s picture book, and her fourth book award in total. She is currently working on her fourth book, a stand alone like her second title, My Silly Dog Gus. All titles available on Amazon.com in paperback, hardcover and kindle e-book. Also available on BarnesandNoble.com in paperback and hardcover.